Part of the charm of living in a great area such as St Johns Wood is returning home to a fresh and beautiful environment. Obviously, that is not going to happen, if you don’t stay on top of your domestic cleaning duties. With a busy work life and family tasks, this can be a mission impossible. Unless of course you enlist the domestic cleaning services of Top London Domestic Cleaners. Our company has been in the industry for quite some time. We provide excellent domestic cleaning in St Johns Wood and the surrounding areas. What do you gain with us? Top London Domestic Cleaners is one of the few companies that can meet your every cleaning need in St Johns Wood. Whether it is professional oven cleaning or regular cleaning service of the place that you are after, our company is ready to accommodate it. Our portfolio has been designed to assist every homeowner in the area. We know just how to deal with any cleaning chore in a quick and successful manner. Don’t just take our word for it – find out for yourself by booking on 020 3322 8143. We know that booking a cleaning company must be effortless and fast. That is why we have taken steps to minimise wait and downtime. There is no doubt that once you call us at 020 3322 8143, you will get a chance to book straight away. All you really need to do is share the details of the job, what kind of cleaning services you need and a dateforf your convenience. We will then proceed to book the service and provide a cleaner per your requirements. Top London Domestic Cleaners is the right company for you at any time! What are the highlights of St Johns Wood? St Johns Wood is surely one of the upmarket districts of London. With its elegant family homes, busy high street, nearby open space and a prime location, it is easy to see why it’s regarded as top London hotspot. The name of the area is derived from a location – the Great Forest of Middlesex – and a Middle Ages period, when it was owned by the Knights of the Order of St John of Jerusalem. Presently, the area is mostly known for its semi-detached villas from the early Victorian period. In regards to landmarks, St Johns Wood has 2 major ones. Lord’s Cricket Ground is one of the most popular cricket venues in the capital of London. It is over 200 years old and home of 3 renowned cricket clubs. Abbey Road Studios is another popular landmark. It is the place where The Beatles recorded. Thousands of tourists have taken photos at the legendary zebra crossing featured on the album cover of the Abbey Road album in 1969. 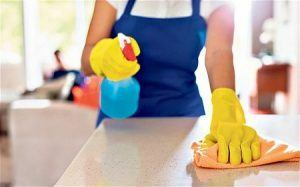 Top London Domestic Cleaners offer efficient and affordable domestic cleaning in St Johns Wood. Give us a call on 020 3322 8143 for more information and availability.